Primal Rock Rebellion is a new band that has been formed by two well known UK musicians - Adrian Smith (Iron Maiden) and Mikee Goodman (Sikth). 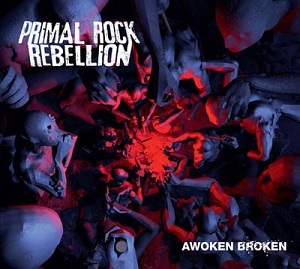 Their debut single was released on 6th February, and now their debut album, Awoken Broken, is available. The music features some great guitar melodies and is slightly heavier than Iron Maiden with more of an edgy feel to it. The vocals are mainly the normal style of rock/metal singing (as opposed to screaming, growling etc), and are extremely good. I must admit to never having listened to Sikth so I can't say if Mikee Goodmans vocals here are a similar style to his vocals with Sikth - all I can say is that they're great here. "As tears come falling" is a very short track - just 47 seconds, and is spoken word with various sound effects and a drum beat. It has the feeling of being in an asylum with the insane babbling and is a slightly odd, almost disturbing track. The track does serve to nicely break up the album and provide some much needed contrast. I have to say I really enjoyed listening to this album. Having been underwhelmed by the last couple of Iron Maiden albums, hearing that Adrian Smith had a new side project didn't seem that exciting, but I have to say that having listened to the album a few times I'd underestimated him badly - I much prefer this album to anything that Iron Maiden have released in the last few years. I'm sure their loyal fans will disagree with me on this, but equally plenty of other people arent that fond of their latest albums. This album is heavier than Iron Maiden, but not so much heavier that it would stop Iron Maiden fans enjoying it. This really is a great album and is well worth buying. If you're not a fan of Iron Maiden I'd definitely still recommend that you listen to the album - it's well worth listening to.